The aspirations of the UAE to achieve economic diversification by 2030 have come a long way towards fruition since the ambition was first touted in the 1970s. A key driver of the progress to date is the aluminium industry, led by the nation’s industrial flagship Emirates Global Aluminium (EGA), which began commercial operations in late-1979 and today ranks among the world’s five largest primary aluminium producers; a burgeoning downstream industry and EGA’s stated intent to develop the upstream industry in the country. EGA’s core operating subsidiaries Dubai Aluminium (Dubal, also known as EGA Jebel Ali) and Emirates Aluminium (Emal also known as EGA Al Taweelah) boast a total of 40 years’ experience and expertise – 35 years from Dubal (which began operating in 1979) and 5 years from Emal (where commissioning began at the end of 2009). 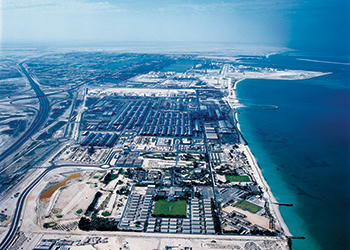 With a production capacity of 2.4 million tonnes (of which approximately 88.5 per cent is exported to over 350 customers in more than 68 countries), a strong international reputation for manufacturing high-quality aluminium products, and a workforce of over 7,000 people, EGA is the single largest industrial entity in the UAE outside the oil and gas sector. With vertical integration through EGA’s wholly owned subsidiary Guinea Aluminium Corporation (GAC), which is developing a bauxite mine and alumina refinery in Guinea (West Africa), and Al Taweelah Alumina, which will build an alumina refinery in the UAE, EGA is well positioned to secure its own alumina resources and to enjoy sustainable growth. At regional level, the aluminium industry is a major contributor to the economic diversification intentions of the Gulf Cooperation Council (GCC) as a whole. 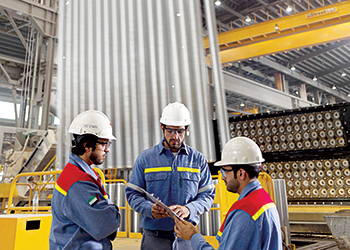 According to analysts, the Gulf aluminium industry is growing by 8.4 per cent annually (compared to the average annual global expansion of 3.5 per cent), making the GCC the fastest growing aluminium market in the world. The region’s total production for 2015 is expected to reach 5 million tonnes, making it the biggest single aluminium producing region in the world. 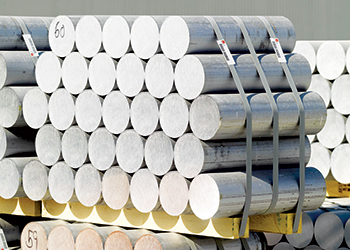 Of the five aluminium producers in the GCC, UAE-based EGA is the largest player, accounting for approximately 50 per cent of all aluminium produced in the region. It is in a position likely to be held for the foreseeable future – not only due to the substantially larger production capacity of EGA relative to the other GCC producers, but also to the fact that 90 per cent of EGA’s annual production comprises value-added products – specifically billet, foundry alloy and slab. The latter places the business well to benefit from the forecast major share growth in demand over the next decade in the areas of transportation, construction and the electrical sector as a result of the drive towards industrialisation and modernisation. A fundamental factor contributing to the sustainable development of EGA is its corporate commitment to operational excellence, with the impressive track records of Dubal and Emal confirming the success of this approach. Both smelters are renowned for manufacturing high-quality, high-performance primary aluminium products, top notch customer service and delivering on promises. And importantly, both smelters have an excellent reputation for operational safety and reduced environmental impact. Driven by a corporate quest to achieve “zero harm to people and the environment”, the operations regularly set new industry benchmarks in key parameters that clearly differentiate EGA from its competitors. For example, in 2014, an ongoing focus on behaviour-based safety led to the Dubal site notching up 9 million work-hours without any lost time injuries. The total recordable injury frequency rate (TRIFR, comprising lost time injuries, restricted work and medical treatments per million work-hours) decreased at Dubal from 2.75 in 2013 to 2.37 by the end of 2014 – an improvement of 82 per cent since 2004. The lost time injury frequency rate (LTIFR, measured per million work-hours) was contained to 0.11 at Dubal and 0.15 at Emal. With regard to greenhouse gas emissions, EGA continued to keep a close watch on operational performance with the help of the International Aluminium Institute (IAI) to ensure that these are contained within international standards. EGA met or performed better than virtually all measures relating to the environment in 2014, specifically with regard to overall perfluorocarbon (PFC) emissions, which were substantially lower than the IAI industry average of 0.27 CO2eq/t Al. Dubal achieved 0.085 CO2eq/t Al – 88 per cent down on 1990 levels; while Emal achieved 0.078 CO2eq/t Al. Benchmark specific energy consumption levels were also sustained in 2014, notably by EGA’s in-house developed reduction cell technologies that offer best-in-class performance capabilities. The DX Technology cells at Dubal and Emal achieved specific energy consumption of 13.16 kWh/t Al and 13.42 kWh/t Al respectively; while the DX+ Technology cells at Emal achieved 13.27 kWh/t Al; and the D18+ Technology pilot cells at Dubal achieved 12.64 kWh/t Al. The overall lower energy consumption results in reduced consumption of fossil fuels, further minimising EGA’s carbon footprint and that of the UAE as a whole. EGA’s DX and DX+ Technologies have drawn the attention of major international players who have expressed strong interest in acquiring licences from EGA to use these high amperage, environment-friendly technologies. Sales of EGA’s technologies offer an additional income stream to the business, contributing further to the GDP of the UAE. EGA has also achieved many technological advances in pot controls, anode rod tracking, effective alumina management strategies, advanced processes for energy optimisation and consumption as well as greenhouse emission containment, among many more. These innovations cement EGA’s reputation as a genuinely concerned corporate citizen and a leader on the global aluminium industry. Emiratisation is at the heart of EGA’s employment strategy, demonstrating clear recognition that a highly skilled and qualified workforce is essential to the future success of the nation. At the end of 2014, almost 20 per cent of the EGA’s total workforce comprised UAE Nationals. Initiatives have been implemented to increase the proportion to 22 per cent by the end of 2015. Moreover, local growth plans are expected to spawn an additional 2,000 jobs by 2020 with an Emirati ratio of 30 per cent overall. Since inception, EGA has been committed to contributing meaningfully to the communities surrounding its operations. The company implements initiatives and hosts events that benefit the community, participates in and/or sponsors activities hosted by charitable organisations, and encourages employees to engage in community work by donating their time and talents. Recent examples of EGA’s corporate social responsibility (CSR) include fundraising for centres caring for individuals with autism; collecting aluminium cans for recycling; and participating in environment clean-up campaigns. The company’s annual CSR plan also features activities to engage employees and the community on important issues such as Earth Hour and World Diabetes Day. 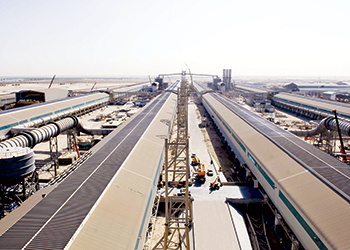 Having developed alongside the mid-stream primary aluminium smelting industry, as part of the nation’s industrial diversification away from reliance on oil and gas sector, the downstream aluminium industry in the UAE also has a 35-year history of direct contributions to GDP and employment opportunities (direct, indirect and induced). With an annual production capacity of 370,000 tonnes in 2012, the UAE downstream sector was the second largest in the GCC (behind Bahrain at 488,000 tonnes). This position is expected to be retained in 2015, reflecting capacity expansions that will boost the annual capacity to 642,000 tonnes, with Saudi Arabia taking the lead at 695,000 tonnes. Within the region, extruded aluminium products have traditionally accounted for the lion’s share of local demand, reflecting the extensive use of these items in the regional construction industry (driven by infrastructural developments). Indeed, demand for extruded products in the GCC has been matched by production. By contrast, the region has been a net exporter of wire rod. The mix is, however, set to change in 2015 as a function of planned expansions and new facilities coming on-stream. Whereas extruded product capacity represented the dominant category in 2012, flat rolled products will lead by the end of 2015 – especially in Saudi Arabia. The increased production capacity in the GCC will not only cater for ongoing local infrastructure development but also the regional downstream to take export greater volumes to meet the forecast growth in demand from international markets. Within the UAE, EGA has been the sole supplier to the downstream industries since their inception. Some 11.5 per cent, (250,000 metric tonnes) of EGA’s annual production in 2014 was sold to the local market – primarily in the form of billets that are used to manufacture components for construction and transportation projects integral to the advancement of the UAE’s infrastructure. An avid supporter of developing aluminium clusters in the UAE, EGA is paving the way for an industrial cluster to take foothold at the Khalifa Industrial Zone Abu Dhabi (Kizad), where Emal is an anchor tenant. A Liquid Metal Transfer facility has been developed at EGA Al Taweelah, to facilitate the transfer of molten metal to adjacent industries via a purpose-built hot metal road. The first liquid metal shipment in Kizad is scheduled for 2016. By receiving liquid hot metal directly from Emal, future industries will benefit from eliminated shipping costs, and significantly reduced energy requirements by eliminating the need to re-melt cold metal and lowered CO2 emissions. These advantages have drawn international attention, resulting in three downstream industry development projects at Kizad – a specialised automotive extrusion producer is under construction, with first production expected in 2016; while a wire rod and cable manufacturer and a foil mill have also been announced, both of which are scheduled for commissioning in 2017. The growth of these businesses will contribute further to economic diversification and provide further employment opportunities in the UAE. Already, EGA provides indirect employment to 19,000 people in the UAE. A further 6,000 jobs are projected to be available by 2020, amounting to a total of over 33,000 individuals employed within the local aluminium sector. Looking forward, EGA plans to boost the key role of the UAE aluminium sector on the world stage by developing centres of excellence in aluminium research and development within the country; as well as forums for knowledge sharing and benchmarking. EGA already works closely with universities in the UAE and across the world, an approach that will not only advance the global aluminium industry but also help sustain EGA’s leading position in the sector. It will contribute to the company’s dedication to continuous improvement through innovation, simultaneously supporting the declaration by His Highness Sheikh Khalifa bin Zayed Al Nahyan (President of the UAE and Ruler of Abu Dhabi) of 2015 as the year of innovation – a position endorsed by His Highness Sheikh Mohammed bin Rashid Al Maktoum (GBE, Vice President and Prime Minister of the UAE and Ruler of Dubai), who has asserted that government must be engines of innovation.